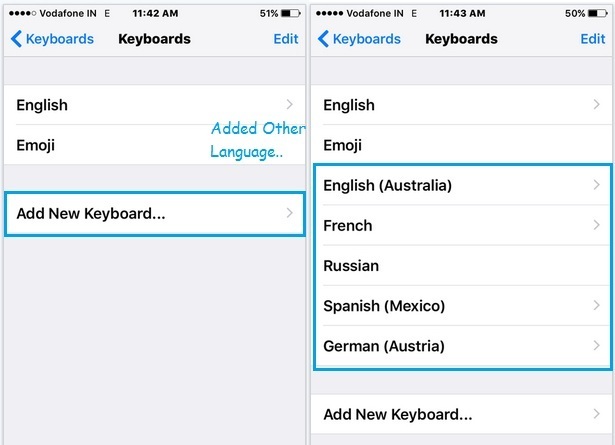 From the Default keyboard language (Switch from English to any other regional language like France, Chinese, Spanish, German, Arabic, Dutch, French, Thai and many other popular international language) without installing third-party app from app store or installing font in your iOS device user can change keyboard language in iOS 10 and iOS 11 later. Direct from your keyboard key you can switch to your tongue that you want in messaging app, Mail, and iMessage. Not only add multiple languages in the keyboard for easy to switch from different language but also you can delete and re-order as of your frequent usage in the list. Step 2: under the Setting > General > Keyboard. Step 3: Default language should be English and Emoji. But now you can add another language manually by the tap on Keyboards. Step 4: Next, Go with Add new keyboard. 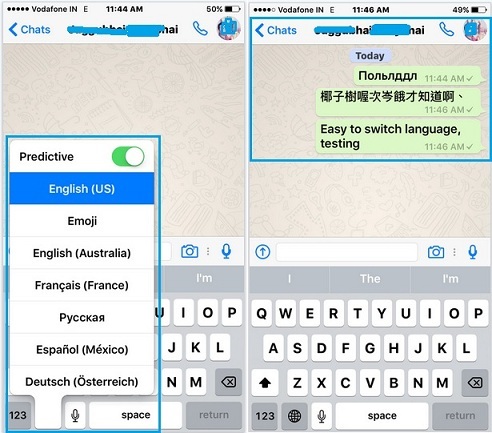 Choose any number of languages, and it will automatically add in keyboard language list. That will be accessible directly from your keyboard when you are typing text. Don’t west time by manually set default language, Once you will start type text, the keyboard will appear on your iOS’s device screen. At last year to the number key, Tap and Hold earth icon. Popup will see the list of all language that you have added for your future use in Message, Chat, and Mail from apps. See the below example for WhatsApp screen. Here I tried with Chinese, French, and English in the different language. To remove added language on the keyboard, repeat the above step 1 to 3. At there you can see the list of all keyboards and remove it by sliding left and tap on delete option. Want more tips and query suggestions on Change keyboard language in iOS 10, iOS 11 or later running devices (iPhone X, iPhone 8 (Plus), iPhone 7, 7 Plus, iPhone 6S, 6S Plus, iPhone 5S/5, iPad and iPod Touch) kindly share with us in the comment box.